Adopt A Cat | Wilton NY H.O.P.E. Below are H.O.P.E. cats seeking forever homes. All H.O.P.E. pets are provided with appropriate veterinary care while they await adoption and all go to their new homes spayed/neutered and with age appropriate testing and vaccinations. Once you have fallen in love with one (or more) of them, please download, fill out and submit an adoption application. If you would like more information or to arrange to meet one of our pets, check out our Events page for adoption events to attend, contact us via email at [email protected] or call (518) 428-2994. We look forward to matching you with a new furry best friend. Adoption fee for cats is $100. H.O.P.E has a senior to senior program, if eligible adoption fees will be waived. 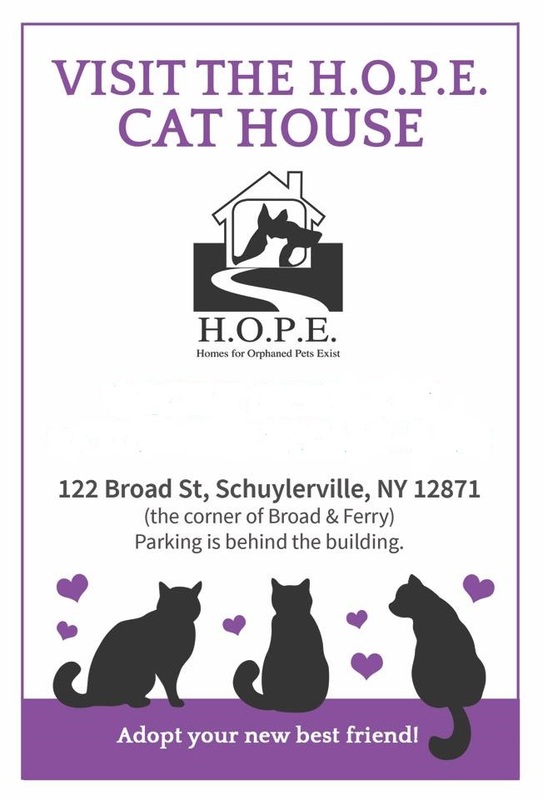 Visit the HOPE Cat House! We’re located at 122 Broad St, Schuylerville, NY 12871. Hours: The cat house is open most Saturdays from 3PM to 6 PM or by appointment.